Before I even made the decision to tear down my previous N scale layout I drew up a quick list of elements the layout must have or improve on and others that were not as important to me. This is a great way to get a lot of ideas and layout elements down on paper and help focus the planning of a layout. Keep in mind that these are only my personal preferences based on my likes, dislikes and experiences so far. Everyone is going to have different elements they want to emphasize on a layout and others that are not as important to them. A double track ‘hauptbahn’ main line with a main station and a secondary ‘nebenbahn’ branch line with one or two stations. The previous layout was all single track with a main station and one smaller station. Once I had it running and set up the automatic computer control I realized that the single track limited how many trains could run automatically to/from staging & the main station. A double track main line will allow me to have more trains running on a more flexible schedule. I love the ‘nebenbahn’ look of short trains running on single track so a branch line was a must if I went to a double track main. The branch line will provide added traffic and some more switching opportunities. The ability to sit back and enjoy the trains. Like many others, my time to spend on the hobby is limited so right now I am often working on the layout rather than just running trains for enjoyment. I like to just set a few trains running automatically while I am at the workbench or working on the layout. This means the layout must have continuous running (vs a point to point or 'endbahnbof' type of plan) and the ability to use computer control. More staging capacity. The old layout had an 8-track staging yard (‘schattenbahnhof’ in German ) running along a wall shelf above my workbench. That still left much of my N scale collection on display and not on the layout so adding even staging capacity was a must. I left the old staging yard intact when I dismantled the old layout with plans of hopefully being able to integrate it into the new layout somehow. Modular. As my post on the old layout detailed, I needed to be able to remove the layout from the room without needing to destroy it if we moved or renovated, or if disaster such as a basement flood occurred. Removing it would mean passing through the narrow doorway and navigating a tight zigzag hallway. This meant each layout module could be no longer than 74 inches high and 28 inches high. The width would have to be kept around 30-36 inches to allow each section to fit around the corners in the hallway. Lightweight. As the old layout came together I realized the Ikea desktops I had used were very light and each section was heavy and awkward to move. For the new layout I decided to go with the more standard open grid benchwork base but use lightweight materials wherever possible. Accessible. I knew I did not want a narrow shelf style layout, so I would need to be able to access all side of the layout to comfortably work on it. The old layout was initially designed to do this but it didn’t work out to be as easy to move out from the wall as I had planned. Faller Car System. I want at least a small road network for the few N scale Faller car system vehicles I have collected over the years. A foundation in era III/early era IV. When I started collecting N I made a choice to stick to era III/IV to help keep things ‘in check’. This allows a great mix of steam and diesel and some of the classics on the Bundesbahn such as the VT 11 diesel railcar train, the V200 diesels and the BR44 ‘jumbos’ to all run (plausibly) together. 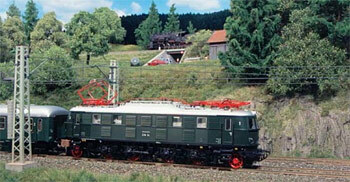 Of course the odd era I Bavarian ‘museum’ train will make an appearance on special occasions. Catenary. 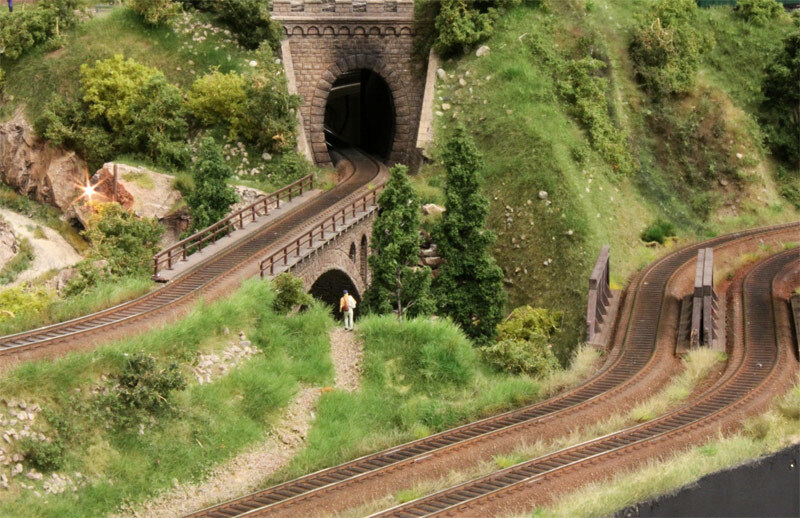 Catenary is an important element of European railroading and there are some nice products available in N scale from both Vollmer and Sommerfeldt but I find in N scale catenary on a compact layout can be distracting and can ‘clutter’ a layout. This is simply a personal preference. I considered adding catenary to the main line or even a separate lower loop with catenary so I could run some of my favorite electric loks realistically but in the end I decided against it. In era III/IV there were still a number of lines in Germany that had not been electrified and were worked with steam and diesel. Operations. The trend in North American model railroading is ‘modeling’ railroads with prototype rail operations and with larger layouts, operating the railroad on a set timetable with a ‘crew’ including engineers running locomotives as well as yardmasters and a dispatcher etc. I enjoy having a layout that lets me run trains by myself and do some switching of cars when I want as well has having the option to just sit back and let the trains run if the mood strikes me. I am not saying a layout can’t do both but in my allocated space and given my other must-have elements, prototype operations are just not as important to me. Strict realism. With a limited space, I knew from the start I would not be able to build a layout that featured both the amount of track I wanted as well as portray a highly prototypical scene (e.g a very accurate portrayal of a specific station and its surroundings). If I had an entire basement to myself plus unlimited funds, I would aspire towards something along the lines of Josef Brandl’s amazing layouts, but right now those elements escape me! I will still try to keep visible curves on the mainline as broad as possible and try to keep the landforms and scenery plausible but I don’t want to be overly restricted by strict realism. Long trains. One of the things that I have always enjoyed about European railroads and particularly secondary and branch lines is the variety of locomotives and rolling stock and shorter train lengths. While I can enjoy the sight of a long Rheingold-Express streaking through scenery on a large layout, I don’t think it would look great on a small layout. The maximum train length will be limited by my staging yard track length which will hopefully be about 48-60 inches, enough for a decently long train but not enough for a prototypically long string of high-speed passenger cars behind an express locomotive. Next up, track planning and starting benchwork construction.